DRUM Sequencer dPad for the iPad! New Media Geekz is proud to present dPad, created by Jason C Martin & Stu Helm in under 7 days. dPad is a fully touch driven drum sequencer for the iPad. CHECK OUT NEW MEDIA GEEKS FOR MORE INFO & UPDATES! The drum machine reinvented (apparently). 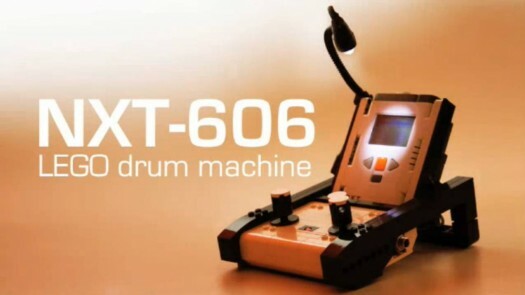 Molten Drum Machine is a powerful and intuitive tool for creating percussive sounds and rhythm sequences. What makes it unique is its approach to grid based pattern sequencing that divides time to instantly add tuplets and fills to your drum programming. Unleash the potential of your beats on the iPad. CHECK IT OUT THE APP AT ITUNES! 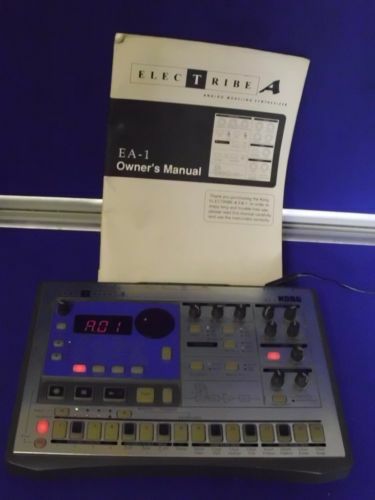 KORG Electribe EA1 Drum Machine + Manual...for sale! This item doesn't come with the original power supply, but the one we have supplied works well with it. When you're laying down your next big groove, you need the phattest, most aggressive analog synth sounds possible. Korg's new ELECTRIBE series uses the ultimate in analog modeling to give you the richest, most versatile analog-style sounds out there. And with unlimited realtime control of every sound parameter, you know your sound will be just that -- yours. Build analog sounds by using the ELECTRIBE·A's waveform, filter and effect knobs. (2 VCO + 1 VCF) x 2 parts Create two-part sequenced phrases using the two analog modeling tone generators. Input external audio sources into the ELECTRIBE·A, process them with its resonant filter or effects knobs, and then sync them to your sequence. Modulate the oscillator using Ring Modulation, Sync,or Decimator. Record filter or effect knob movements of the Synthesizer section in realtime using the "Motion sequence" function. 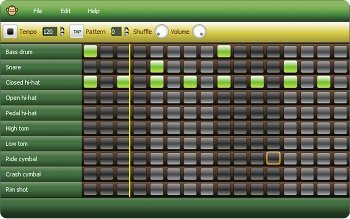 Store a total of 256 (64 x 4 banks) phrases or patterns plus 16 songs consisting of multiple patterns. Sync the ELECTRIBE·A to other MIDI devices using tap tempo or MIDI clock, or tap in the beat and sync to a turntable or other non-MIDI sound sources. Use the Tempo delay, chorus/flanger, and distortion effects to finesse your sounds and patterns. Control the ELECTRIBE·A from an external sequencer and use it as a MIDI expansion tone generator. Get yourself a Log for Christmas... plug in the lead,stamp your feet, feel the beat. It's that simple and it's the most portable kick drum in the business. 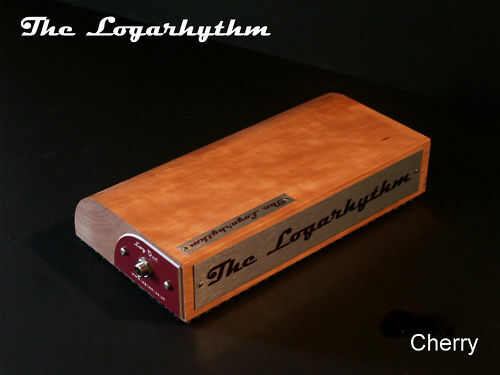 The legendary Logarhythm stomper... now in 4 tonewoods. Sapele (original), Cherry, Walnut & Maple. Make your choice either by Email or send us a note with your Paypal payment. Here's a little bit of (non!) info from the seller! THAT IS AS FAR AS I CAN TEST IT ,,FOR THIS REASON IT IS AS IS NO RETURNS!!!!!!! GOOD LUCK BIDDING ON THIS RARE HARD TO FIND ITEM !!!!!!!!!!!!!!!! 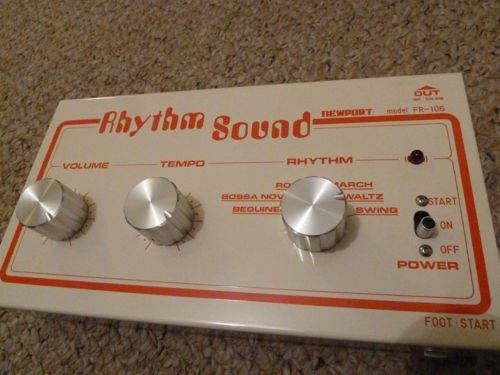 RARE GB Rhythm analog drum machine pedal Colorsound...for sale! 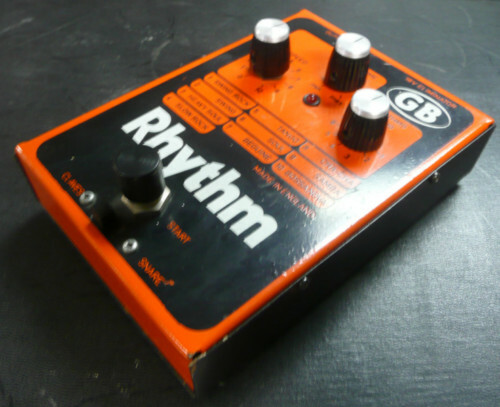 A very RARE GB Rhythm drum machine pedal from the 1970's that I think was made by the historic Colorsound company in England. Works 100% with no issues, just tested into my Fender Vibrolux Reverb and it sounds like it did back in the day when I used it with my Guitorgan Condor GSM rig. Sounds sooo friggin cheezy its cool. Every setting 1 to 10 works along with the speed and volume controls. Runs on 2-9volt batteries for 18 volts of DC power. If Dr Dre, Ez E and Ice Cube had this back in the day with N.W.A instead of the TR808, the drum machine sounds would have been a lot cooler in my opinion. BID FOR THIS ITEM ON EBAY! SHAMELESSLY KNICKED FROM THE MIGHTY MATRIXSYNTH! 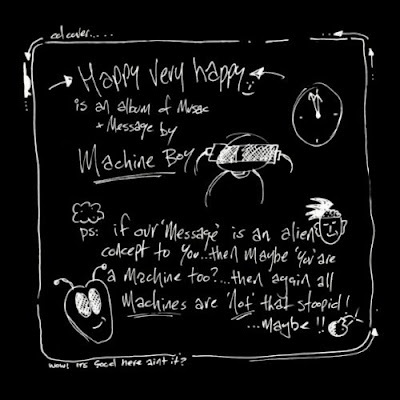 MACHINE BOY the Happy ep out NOW! 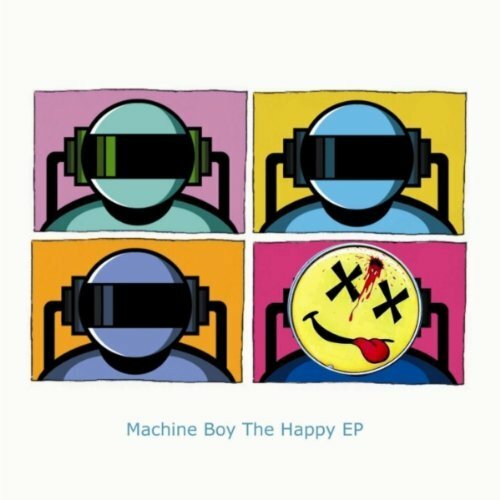 Machine Boy is in NEW EP 'dRUmACHINE' land heaven with 'The Happy EP' it contains a bunch of weird & wondefull mixes of 'Happy Very Happy' including a monster 16 minute mix! wow we hear you say WOW INDEED!.....you can get it from all the usual download websites such as Amazon, iTunes, HMV, Spotify etc! enjoy! CHECK IT OUT AT ITUNES! SEQUENTIAL CIRCUITS TOM 8bit vintage 1985! MONOLOG vs. Linn Drum II! 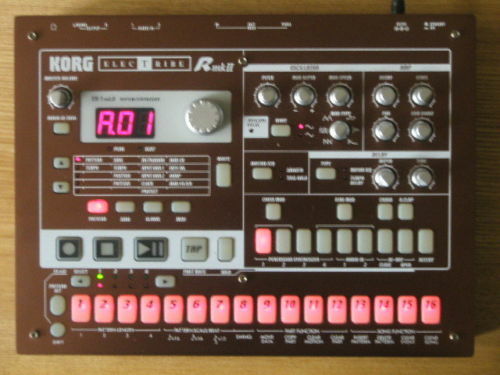 LINNDRUM Essential 80s Beats part 1 Korg Electribe ES1mkII! RHYTHM Ace 1969 Bent By Oceanus! ELECTRO Harmonix Rhythm12 Vintage 1970...for sale! 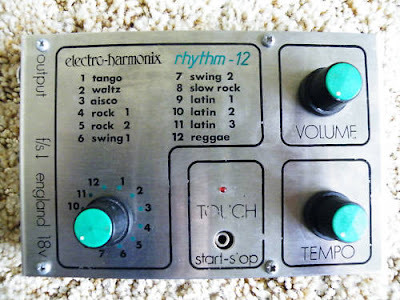 This electroharmonix rhythm 12 is a cool vintage drum machine made in the 70s. It worked last time it was used but I cant find the power supply for it. NERWPORT Rhythm Sound FR106 from Jeff Keen....for sale! Nice little preset Drum machine with original box. Has been tested and sounded great! Nice old bossanova etc. style patterns. This unit is in very nice cosmetic condition. Straight from Jeff Keens studio. 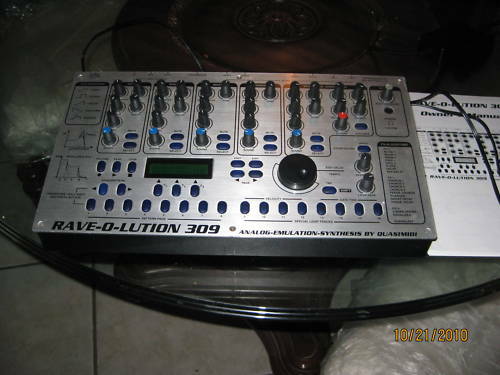 QUASIMIDI 309 Groove Box Rev-o-Lution 309....for sale! This is a used item in good working condition, for cosmetics please view the pictures on the ebay page, follow link below for more! Studio Gear Etienne De Crecy! Studio Gear: Etienne De Crecy from will seelig on Vimeo. 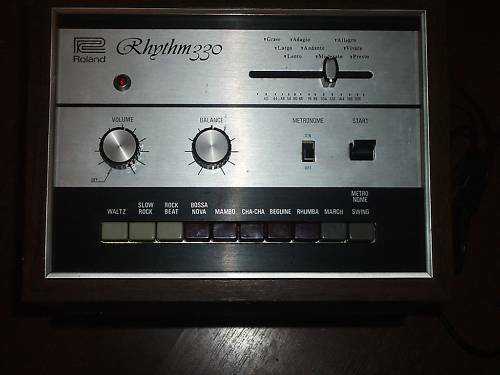 ROLAND TR330 Rhythm analogue...for sale! This is rare in the UK seems to work fine, internal speaker and output for amplification and footswitch socket. A little crackle in the knob when you turn it on but sounds great if you like those vintage sounds. minor chip in the wood veneer but overall a nice presentable example. Apparently these are suitable for circuit bending if you are into that. Please note I will not send outside the UK so don't ask. You can pick it up from London E17 if you prefer. CLICK HERE TO CHECK OUT & BID ON THIS ITEM! 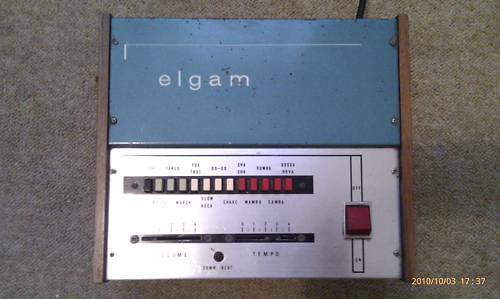 ELGAM Match 12 vintage analogue...for sale! Elgam vintage analogue drum machine from the 1970's in full working order. Rare to ebay and hard to find alot of info on the web. Has a some tiny rust pits on it but nice its a nice colour and wooden ends for that vintage feel! I think it originally had knobs on the sliders but they work fine. Measures approx 12 x 10 inches. Nice addition to any vintage collection. Cash on collection is possible from the Reading area otherwise i can post. 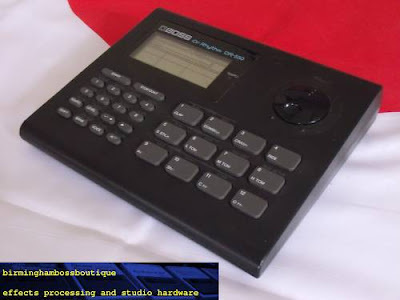 It's a great little tool with lovely retro eighties sounds (it was released in '88) and the only reason I'm selling it is because I generally use my computer for samples now. If you want great sounding beats and samples I can't recommend it enough. CLICK HERE TO CHECK OUT THIS ITEM & TO BID! BOSS Dr. Rhythm DR550...for sale! Item is unboxed and without instructions, cosmetically in grade C/D condition, fair amount of wear to the finish and the battery cover is a replacement hence is a slightly different colour; I noticed while testing that some of the pads/buttons are not as responsive as they should be- all of the buttons do work, just some require a firmer press than others. Aside from this the item is in good working order. World shipping available; please contact me for a price if your country is not listed. CLICK HERE TO CHECK THIS ITEM OUT AND TO BID! We're in MFB heaven today...here is the MFB 503....sweeeeeeeet! CHECK OUT MFB AMAZING PRODUCTS AT THEIR WEBSITE! We're in MFB heaven today...first off the MFB 522.....splendid! FARFISA Partner 15 Vintage....for sale! 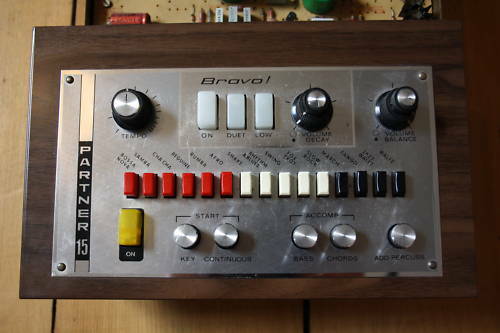 This drum machine has recently been isolated from a Farfisa 252RS organ. It provides a selection of warm, retro drum patterns of the bossa nova variety that frankly sound awesome! A number of dials give you control of tempo, volume, etc. As you can tell from the picture there a number of wires emanate from the rear, this is where I have separated it from the organ. I expect the winning bidder of this machine will know what to do with them. 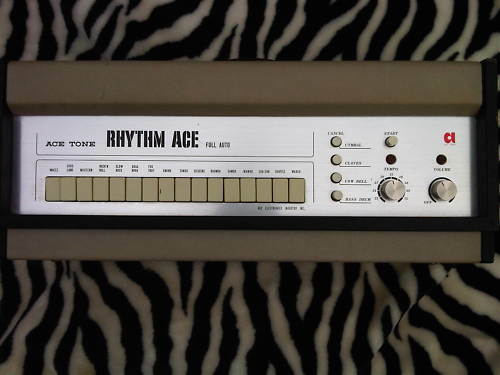 ACE TONE Rhythm Ace...for sale! 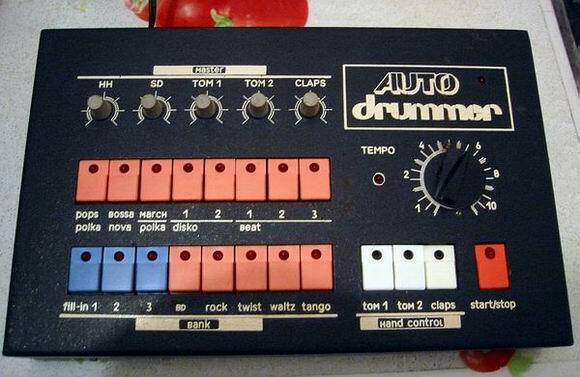 A real piece of drum machine history! contact me if you cant collect in person . P.S the leather handle is now showing signs of wear and will need replacing. It has worn through to the metal reinforcing strap . as the first transistorised machine to appear on the market in 1967. (founder of Ace Tone and later, Roland in 1972). via a mechanical disc system. Transistors x 38 and diodes x 107!!! 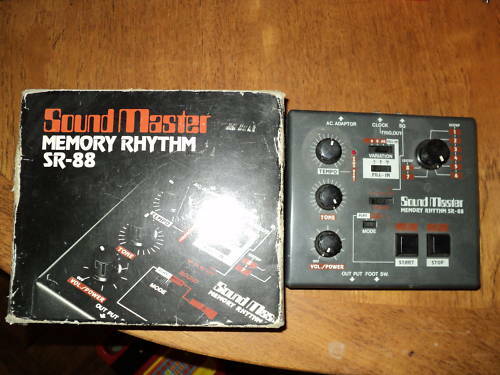 RARE SOUNDMASTER Memory Rhythm SR88...for sale! This SoundMaster Memory Rhythm SR88 Analog Drum Machine is offered in an excellent working condition. It is quite a rare item and still has its original box. Its instructions are missing, but it is very easy to use. Im sure if required the instructions probabaly could be found on net. Any questions etc. please fell free to ask. CLICK HERE TO CHECK FOR MORE INFO & BID ON THIS ITEM! 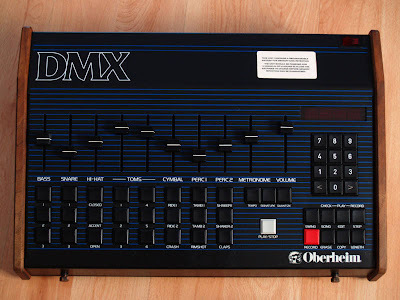 Ok ok so I just nicked this video after it was posted on the finest blog in the whooooole wide worlds Matrixsynth!........but a great little video of a very neat and rare machine! wonderfull. CHECK OUT THE ORIGINAL POST ON THE MIGHTY MATRIXSYNTH! 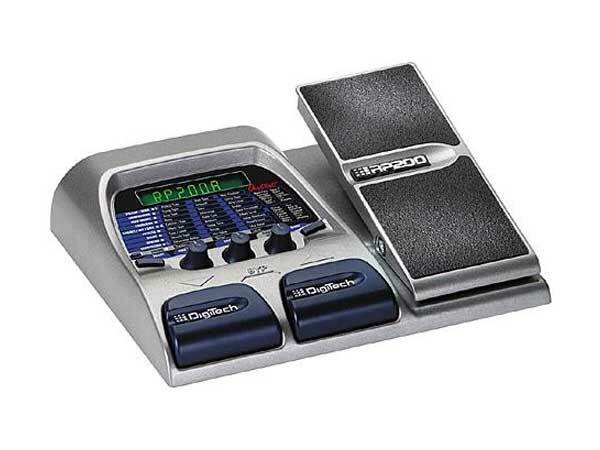 DIGITECH RP200a expression pedal,drum machine,tuner...for sale! Absolutely brilliant bit of kit, once youve worked out what you like on it its wicked. easy to use and its good at making you sound better than you actually are. KORG DDD 5 Dynamic Digital Drums...for sale! Classic '80's retro sounding' Drum Machine. Complete with Professional Gold,3metre MIDI Cables. CLICK HERE TO CHECK OUIT & BID ON THIS ITEM! THIS DRUM MACHNE IS A PERFECT ACCESSORY FOR ANY RECORDING ARTISTS OR FOR THOSE WHO JUST WANT TO PLAY ALONG! ACETONE BENTLEY RHYTHM ACE Vintage 70s...for sale! 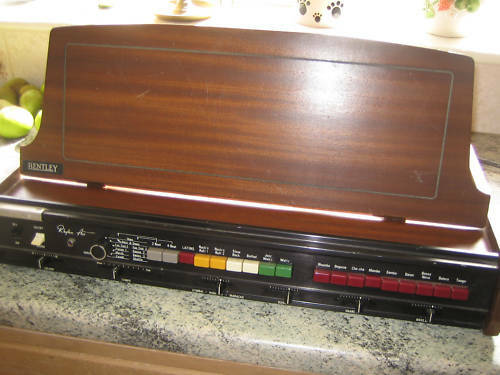 Acetone BENTLEY RHYTHM ACE Vintage 70s Drum Machine. 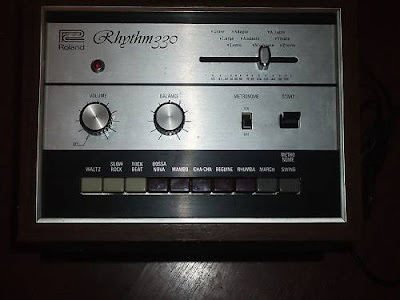 Here is a fantastic vintage drum machine from Acetone - who later became Roland, this is the Bentley Rhythm Ace (yes the band was named after these!) and dates I believe from the 70s. Its a classy looking machine in a real wooden cabinet with a wooden music stand which locks in the upright position, or can fold flat. It has buttons to select rhythms such as Rock n' Roll, Swing, Ballad, Waltz, March, etc., and a large selection of Latin rhythms, etc. The sounds are cheesy but very useable. There are sliders to control volume and tempo, and you can balance the volume of separate instruments such as bass drum, cymbals, snare, guiro & claves, or remove the instrument from the mix completely. 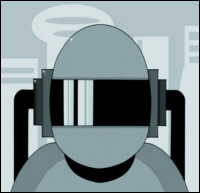 Think Jean Michel Jarre Oxygene to get an idea of what this can do, also more modern retro music like Air. Fully analogue it has a lovely warm vintage sound. I've cleaned and polished the cabinet, and cleaned the jack sockets and slider controls. Everything seems to be working perfectly. You can silence the output (while keeping the pattern running), or start and stop the rhythm instantly with a neat 'touch' plate on the front. There is also a start/stop socket on the back for a footswitch, but I haven't tested this. JAMTUNER with added drum machine goodness...for sale! 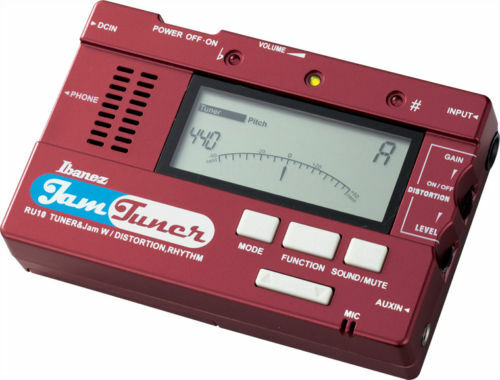 The Ibanez Jam Tuner is a chromatic tuner that comes with the works, jammed right in. The Jam Tuner features a hi-Spec wide LCD display, 20 drum rhythm patterns for practice and jamming, a distortion effect, an AUX input for CD or MP3 players and a built-in metronome. 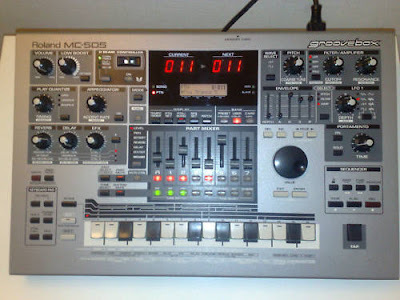 ROLAND MC 505 Groovebox...for sale! LINN 9000 Completely serviced by Bruce Forat....for sale! 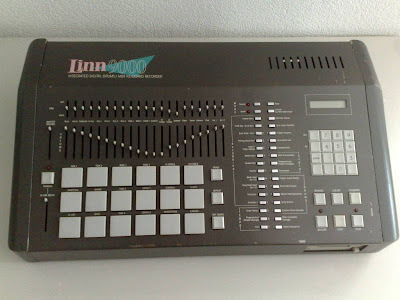 For Sale here is the legendary Linn9000 drum machine/ sequencer/workstation. This Linn9000 is completely serviced/restored/updated by Bruce Forat at Forat Music Electronics in the US. (http://www.forat.com/drummachines/9000.htm). This machine is an absolute must!! It has a few scratches but mechanically it is in top conditon!! It sounds amazing! 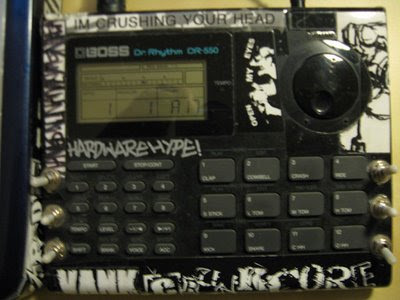 This machine blows every drum machine easily away. 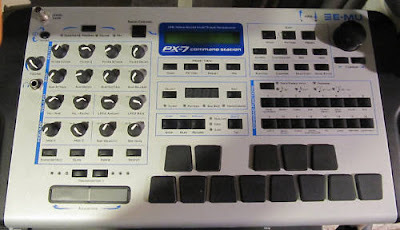 But that's not all, it is a very elaborate sequencer and sampler! - Besides the 40 K.ram memory that was already available in this Linn9000, Bruce added a 68K static RAM memory expansion. I also transferred an other 128 K.ram card into the Linn9000 so now the total is 236 K. ram memory in total. 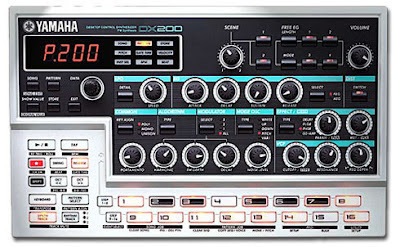 On screen editing features such as Event and Global edit (note, velocity, duration, tuning, hi hat decay and erase), two types of punch (manual or programmable), recording all controllers such as MIDI volume etc., event chase, MIDI drum note assignment, copy individual tracks or drums, merge and replace, Time shift of notes and drum events, re-timing correction of individual drums or tracks after recording, 156 steps of drum tuning recordable during the sequence, MIDI System Exclusive recording for keyboard sounds, sample editing (truncate, reverse and fade), drum solo and mute, better and faster erase and many more. The Linn9000 also comes with the latest 7.09 software manual to guide you through all the amazing features! http://www.givemedrums.com Click the link to get your FREE download! Better sounding than a drum machine and easier than software. Instant drums - Its Give Me Drums! Throw away your akai pc fl studio logic pro tools cubase addictive bfd from hell animusic yellow strike streetbox rebirth and ableton. You Dont need them! 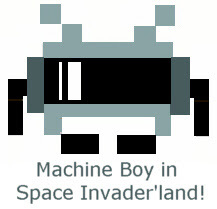 NEW Machine Boy album....full of DruMachineBoy grooooooves! oh yeh! OUT NOW! DruMachineBoy aka Machine Boy release their latest slice of drum'machine'driven'wonky'lofi'grunged'up'electro'hooliganism today and its available NOW!...its called 'Happy Very Happy' and you can get it from Amazon, itunes, Beatport, play.com, HMV etc etc...basically all the TOP mp3 retailers now have the release available, check it out and give Machine Boy some support if its your bag...he'll love ya for it ;-)! This is a short video of a simple beat made in real-time on a DS running Bliptracker, a homebrew drum-machine app. A short video about the drum patches within the very fine Korg DS10 on the even finer Nintendo ds machine!....here's some info from the original youtube post'dude! http://www.youtube.com/user/ChrisLody I've been sat with ds-10 for a few nights now learning a few things about drum synthesis. I knew a little theory, but mostly I have just let my ear guide me. After a million indescicive tweaks I came up with a drum kit I think is good enough to share with the world. There is 5 drums in total. A kick, snare, closed hi-hat and open hi-hat in the drum section, then also a distorted tom loaded into pattern 6's syn2. p.s. I'll add some annotations when the damn thing'll let me! I'm guessing it'll work with ds-10 plus also but I've no way to test it. Great website with tons of amazing Soviet synths plus they have a great section with beat boxes & drum machines....amazing stuff!! check it out by clicking HERE! 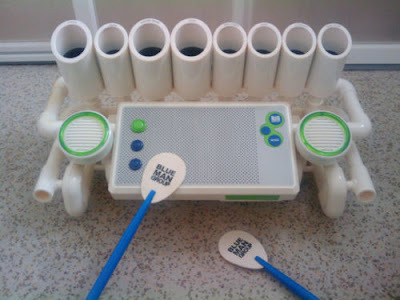 drum machine from a kids toy that triggers a 7 step sequencer. 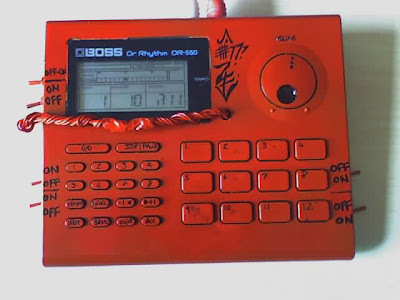 can change triggering patterns by adjusting the parameters of the drum circuit." circuit bent "
DIY ANALOG Synth & Rhythm Sequencer MK2! Dual, 2 part, oscillators with hard sync and independent pattern generators for Pitch, PWM and Gating. 3 quick routines here, with the synth synced to Logic via an Audio Gate Input and hard sync provided by a square wave from an external soft synth. RAW-BEAT-QUAD Analog Drum Synth and ASC1 Sequencer! 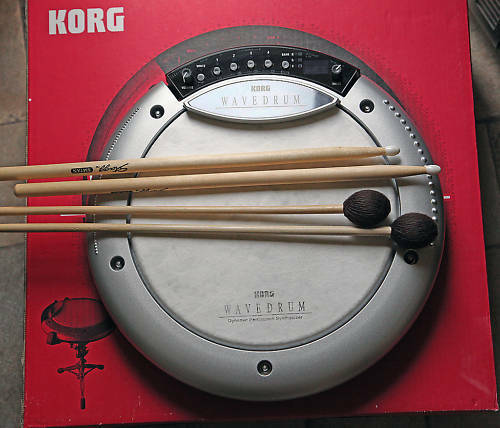 KORG Wavedrum Dynamic Percussion Synthesizer Pad! Available from www.gear4music.com A video introduction to Korg Wavedrum Dynamic Percussion Synthesizer Pad. JHS Pro Rhythm Analogue Drum Synth! JHS Pro Rhythm Drum Synth Analogue Drum Pad, as used on countless 1970s disco tracks, DUB reggae beats etc. METASONIX D1000 Vacuum Tube Drum Machine! Here is the latest from Metasonix, the all new D-1000 vacuum tube drum machine. It is the first all tube drum machine since the Wurlitzer Sideman was introduced 51 years ago in 1959. CHECK IT OUT AT BIG CITY MUSIC! This is a pretty rare drum machine manufactured by EKO in 1972 in Recanati, Italy. Model ComputeRhythm, maybe one of 15-20 ever made (curiously SN #0113). This particular one is owned by a musician living in Spain, and It was repaired and slightly modified by me on the past months (www.synthoma.net). Before giving back to its owner I have the chance to made these demonstration videos to show its features and incredible programing methods. Due to the price it was mainly used by famous electronic musicians like Jean-Michel Jarre and Manuel Göttsching (founder member of Ashra Tempel). J-M Jarre has used it extensively on his first albums: "Oxygene" and "Equinoxe". Please, enjoy this first demo, and sorry about the poor quality video. It was made by a webcam. However, the audio was taken directly from the mixer. If there are any interest in to get samples of this machine (free, of course :) please, contact me at synthoma@synthoma.net or via YouTube message. GREAT CONDITION CR-8000 VINTAGE DRUM MACHINE IN ORIGINAL BOX AND WITH ORIGINAL MANUAL. EVERYTHING APPEARS TO FUNCTION CORRECTLY. THE LETTERING HAS FADED ON THE BUTTONS(SEE PIC. The AirBase 99 is based on the XBase 09, but is much better. It has many of the same great TR-909 sounds and much more but comes in a 1-unit rack-mount MIDI module rather than a table-top drum sequencer like the latter. Its front panel is extremely bare, with just 2 knobs and a few buttons and LEDs. The AirBase is designed for use as a Drum Tone Module with your sequencer. Programming is easiest through MIDI control of the parameters. The AirBase features the same sounds and parameters as the XBase 09 and adds increased polyphony (9 voices) and Tom Toms. The AirBase emulates 808, 909 and CR-78 style sounds with excellent quality. Kick, Snare and Toms are analog and feature various tune and envelope controls. Hats, cymbals, clap and rimshot are samples but can still be tuned and reversed! 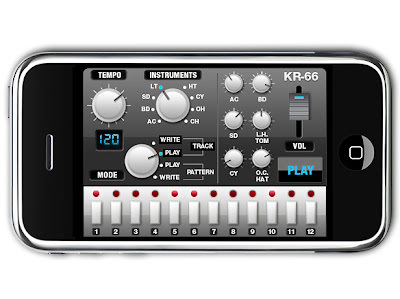 For emulated 808 and 909 drum machine sounds, the Airbase 99 is great! 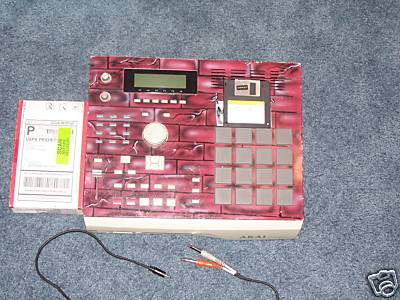 It costs half as much as getting all of the real drum machines. The AirBase 99's cool features include both high and low pass resonant filters and a band pass filter to apply to the hi-hats! There's more parameters to edit per each Drum Tone than the Drum Station or any of the original beat-boxes and there is almost 38 times more patch memory in the Airbase with 1,024 user and 500 preset drum kit settings! Two global LFOs can modulate the pitch of any sounds and sync to MIDI. Of course there are individual outputs for each drum sound as well as a stereo out. 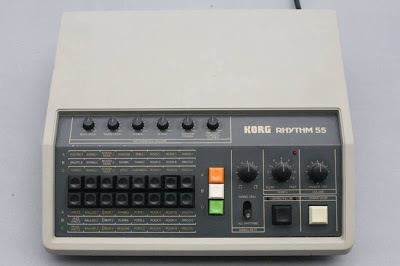 KORG KR55 vintage 1979 Complete...for sale! Well used but well loved. Fully working despite some wear. on any other auction. It's also in the UK, so no massive shipping costs. flip back the front section, fit your connections through the zip slot and you're ready to go. This piece of kit was central to the set-ups of Jean-Michel Jarre & Depeche Mode. of it's great sounds and easy means of changing settings. This machine is not only collectable but a very realistic and relevant tool for use today. 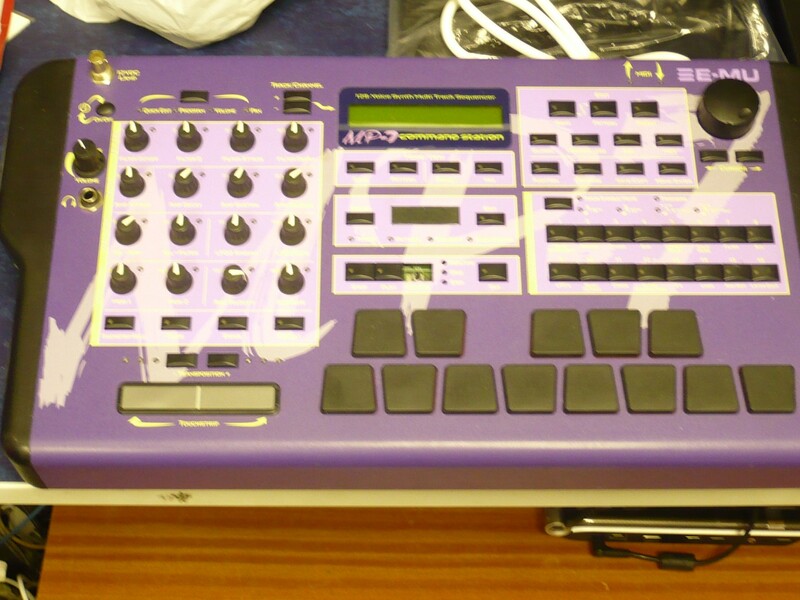 E-MU MP7 command station...for sale! PLEASE NOTE MISSING RECORD BUTTON(see pic) BUT STILL FUNCTIONING WELL. MFB Schlagzwerg Semi Modular...for sale! Up for auction is my MFB Schlagzwerg Semi-Modular analogue drum machine. I bought the Schlagzwerg only a couple of months ago brand new from Thomann. 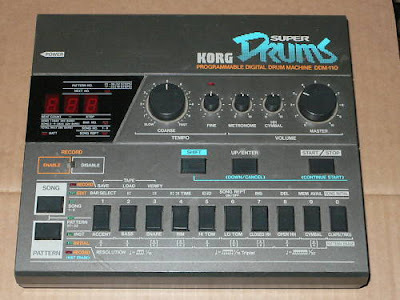 The drum machine has only had around 4 hours use and is in brand new / mint condition and comes boxed with manual, power supply and additional patch cables. MFB SCHLAGZWERG combines the power of analogue drum and percussion sounds with modular versatility in a convenient and compact desktop unit. SCHLAGZWERG fusions CV-controllable percussion modules and a six-track CV/Gate-sequencer into a unique drum-machine for live and studio applications. Thanks to its semi-modular concept, SCHLAGZWERG is ready to go without any need for patch-connections. Its internal pre-wiring comprises trigger-assignments for the gate-tracks of five (of six) drum-sounds as well as hihat decay-control. The additional CV-tracks can freely be patched to any of the modules’ functions. Naturally, the available CV-inputs can also be addressed by external control sources like LFOs, envelope generators or a Theremin-controller. Kick, snare and tom (DRUM-04/-05/-06). Step-sequencer with 16 steps and 16 A/B-patterns. 6 gate- and 6 CV-tracks. Separate CV/Gate-tracks, e.g. for use with Kraftzwerg. 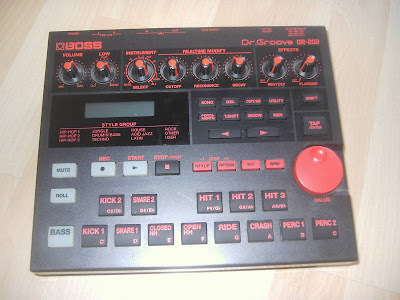 The SP-808 GrooveSampler was originally released in 1998 as an all-in-one phrase-sampling music workstation. 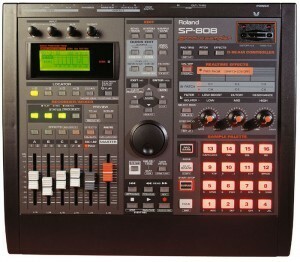 It was released as part of Roland's Groove Gear. 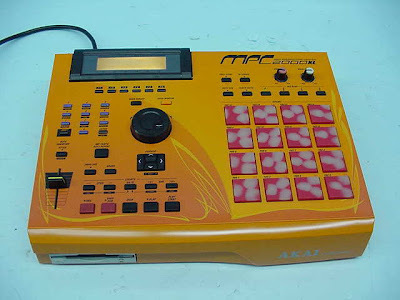 The updated SP-808EX (pictured) adds a cool new translucent design, many enhancements, and is now dubbed the e-Mix Studio. 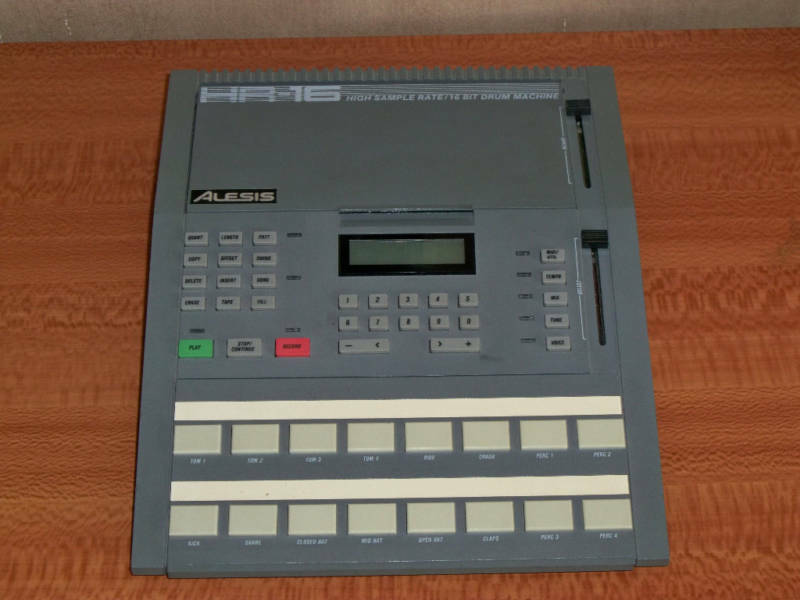 Essentially the SP-808 is a phrase sampler with a pattern sequencer, hard-disk digital multitrack recorder, high quality studio-effects, and more! 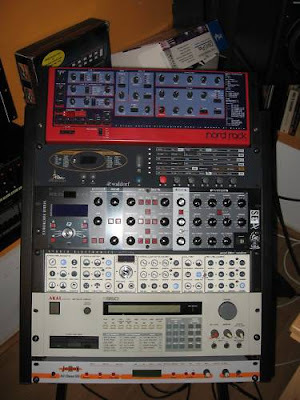 Both machines are geared towards sampling musicians, remixers, broadcasters and DJ's. 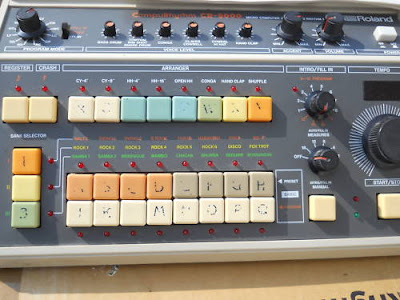 The original SP-808 (GrooveSampler) can play up to four stereo samples simultaneously. If that seems a little thin, you can always bounce the samples down with any mixing, editing and effects you may have applied, opening up those tracks for more samples. It samples at 44.1 and 32 kHz sampling-rates, with a maximum sample time of 25 minutes of stereo 44.1 kHz sampling! 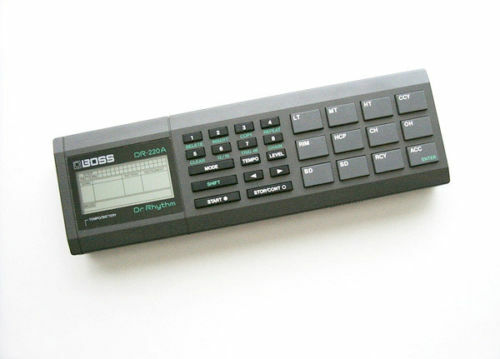 Sample via analog or digital inputs, the SP-808 holds over 1,000 samples! Its sampler has a full set of editing features and some nifty tricks to make sampling very easy! BPMs of loops can easily be adjusted to match song tempo. All samples are stored/read directly from the 100 MB Zip Drive rather than internal RAM memory. AIFF and WAV audio formats are not supported as Roland is using their own proprietary sample storage method to maximize sample space on ZIP disks. Studio quality effects include a filter, reverb, delay, pitch shifting, distortion, phaser, compression, Karaoke mode, and many more effects. There's also a D-Beam controller to tweak pitch and volume - Theremin style. Effects are realtime tweakable, but only one effect can be used at a time, so it pays to resample your sounds with effects processing to use more effects. Recording is also pretty easy. Once you've filled the unit up with all your samples, they are available via the pads labelled 1 - 16. Like the VS-880, arm any of the four tracks you want to record to. Hit Record and trigger samples from the sample pads, add effects, adjust levels and do some panning. Songs can be recorded in real time or step time. The multi-track section has some nifty features of its own to make it quick and easy to use. The SP-808EX (e-Mix Studio) has a virtual monophonic synthesizer for use with the step-sequencer and D-Beams. It also has new vocal and guitar multi-effects, a 10-band vocoder, Voice Transformer and Mic Simulator, plus dozens of DJ-oriented groove effects. A larger 250MB Zip drive replaces the original 100MB Zip for expanded sampling/multi-track recording time, up to 61 stereo minutes, compressed. Expansion options include the OP-1 interface (6 analog outs, 2 digital I/Os, SCSI) or OP-2 interface (XLR I/Os, digital I/O, SCSI). For use live or in the studio, the SP-808 offers a complete music production package! 80s OBERHEIM DMX Analog eprom...for sale! KORG KR55 vintage analog w.DIN-SYNC mod!...for sale! 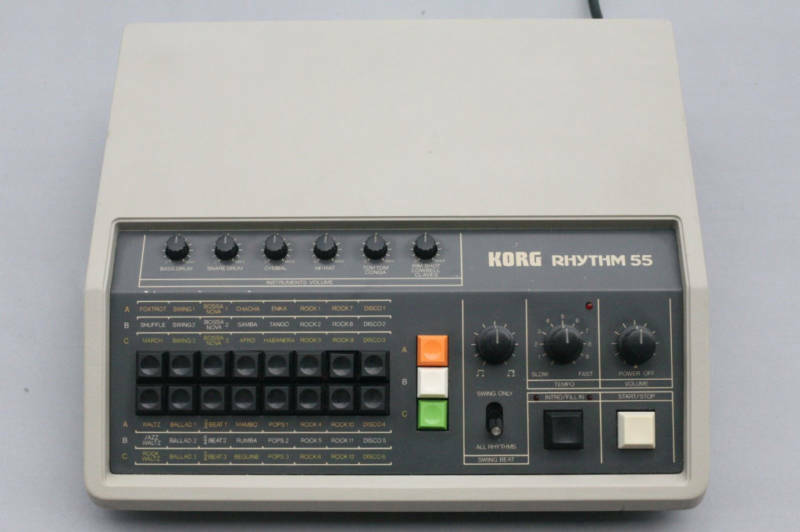 You are bidding on a KORG KR-55 vintage analog drum machine in good condition. 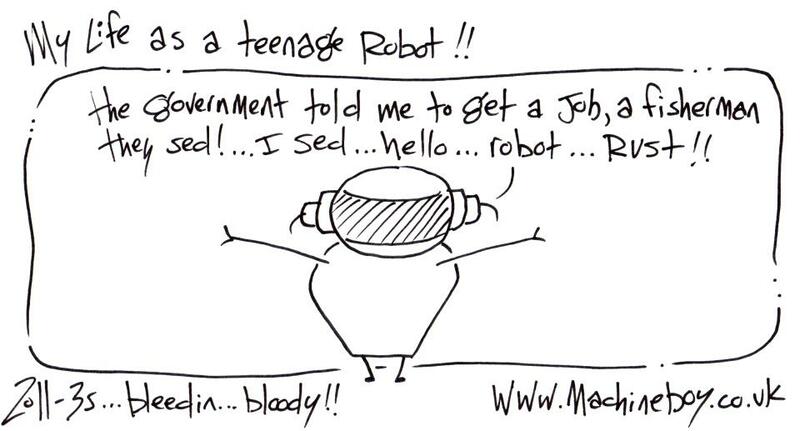 It's been modified by a technician (RAMCUR on Flickr). 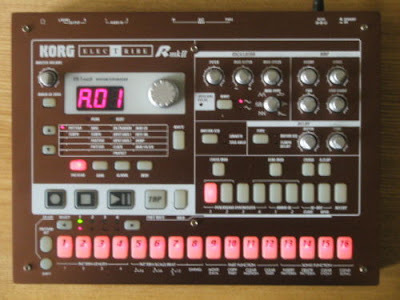 It has a Roland type Din-sync Sync24 input that makes it possibloe to sync the machine to Roland gear any other Din-sync device or a sequencer or computer if you have a MIDI to din-sync device (from Kenton or other makes). It can also be used "stock" as a master as well. The unit also has individual output mod so you can records and process the sounds separately. All buttons and potentiometers work fine. I ship worldwide and pack well, please email me with any questions including an exact shipping quote. 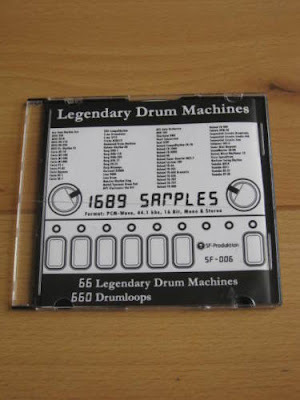 LEGENDARY Drum Machines SAMPLE CD...for sale! 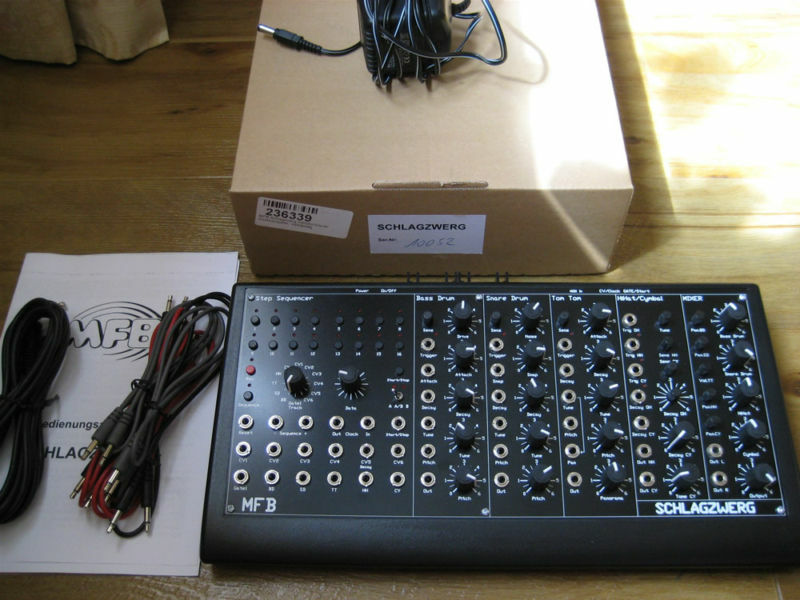 Has the superb Morpheus filters and front panel real-time control with 16 knobs. The Korg nameplate has a few scratches and shows some slight discolouration but this does not affect operation of the machine which is perfect! Monkey Machine is a free online drum machine intended for music practice purposes. •High quality drum samples provided by Natural Studio and Hydrogen. •Online drum beat database with over 10 000 downloadable drum beats. CHECK & LAUNCH MONKEY MACHINE HERE! KR66 Virtual for the iPhone! CHECK OUT THIS LINK FOR MORE INFO! 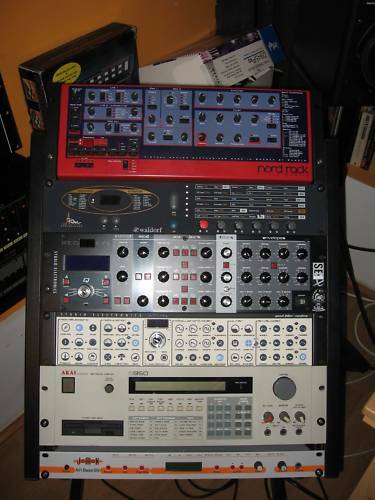 MOBY and his deeeeeeliceous drum machine collection! Mindstorms is LEGO’s answer to the future of its brand. It’s basically a product extension of classic LEGO’s that enables customers to do everything from program robots to build ultrasonic sensors. This drum machine, made entirely out of LEGO, was build by Peter Cocteau and is an 8bit sample based machine. CLICK HERE TO CHECK OUT ORIGINAL POST! 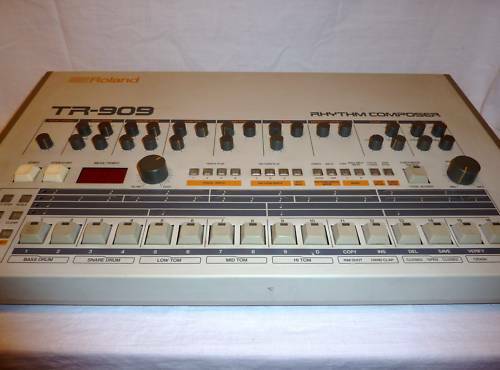 Welcome to the auction for a Roland TR-909 drum machine looking for a new home. I need to downsize, so this is a reluctant sale. This machine has been in use in my home studio for about 5 years so I can confirm that everything works. As you would expect for a machine of it's age it has a few marks and scuffs here and there. These are mainly on the plastic end panels, but it's pretty clean overall. A few of the volume pots are a bit worn at certain positions through use, e.g. on the hi-hats. But this easily worked around by setting the volume slightly above or below that point. Unless you want to live mix by turning those knobs, it's not an issue. The machine is built like a tank! 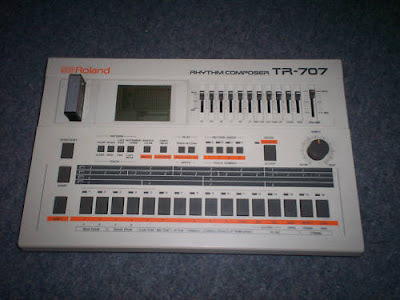 Roland TR-707 Drum Machine. I had this imported this from Japan about three years ago and it's been worth every penny! Rock-solid timing and the perfect studio clock master for MIDI & DIN SYNC 24. It's in excellent condition and has absolutely no operational issues. No crackling pots, no unresponsive buttons and all faders fine. Sounds fantastic. Cosmetically, it has a two chips in the casing (from the previous owner), but this is to be expected from a 25 year-old classic. It comes with a power supply, though not the original. ***M-64C Cartridge is for sale via another auction, Postage price includes registered delivery. UK AUCTION ONLY. NIN using the JazzMutant Lemur! NIN: Echoplex - Live at Rehearsals, July 2008 [HD] from Nine Inch Nails on Vimeo. Great live in the studio clip of NIN Echoplex...great to see them using the JazzMutant Lemur!....great clip!...enjoy! 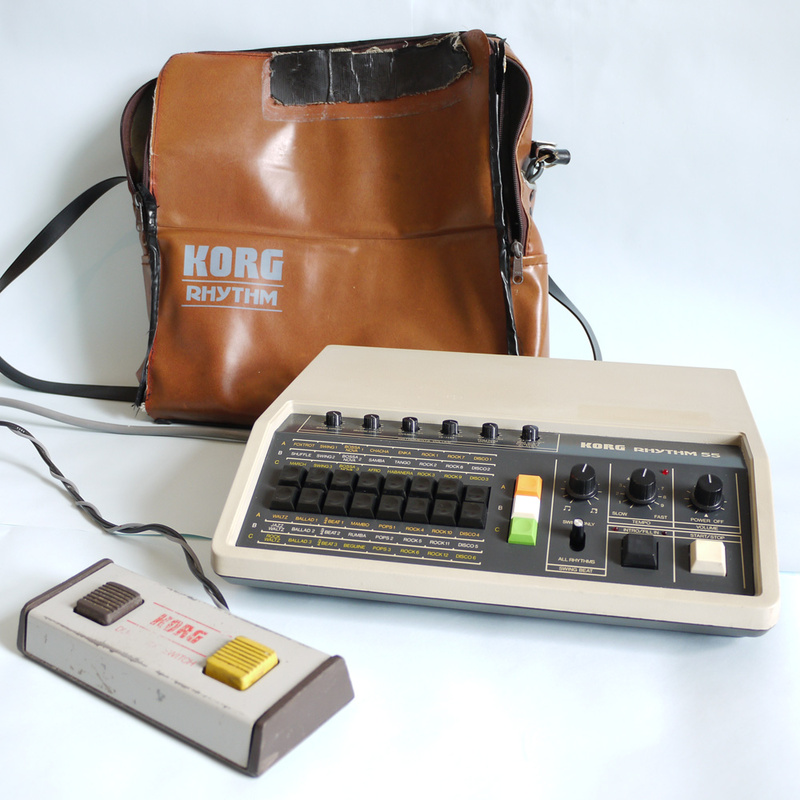 In excelent condition and includes original PSU, manual and packaging. With a more powerful groove than ever before, this advanced rhythm machine arms you with an analog beat that’s all your own. The intuitively designed Electribe•R mkII is packed with fat, innovative sounds produced by DSP synthesis technology, a classic interface for creating beats and tweaking them in realtime, and the ultimate array of up-to-date dance styles. - An amazing rhythm machine with a cool new look! 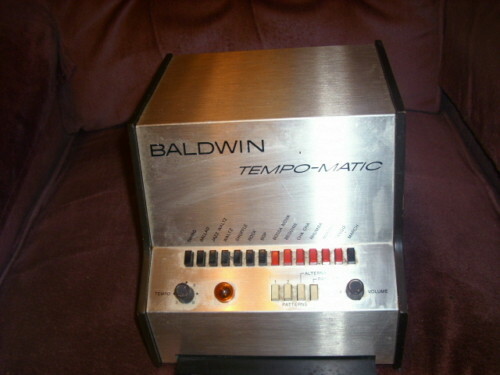 - Tap Tempo and MIDI Clock for synchronizing with an external sequencer, etc. The Electribe•R mkII is a new generation of rhythm machine that is enhanced by spontaneous knob-based editing of analog drums and sound effects. After you create your ultimate sounds, you can use the Electribe•R mkII’s internal step-sequencer to create original rhythms. Sound editing is simple; just turn the knobs to adjust the various elements of the sound. You can use the onboard sounds in conjunction with the external audio input to create unconventional rhythms that have never been heard before. KORG DDM110 "Super Drums"...for sale! 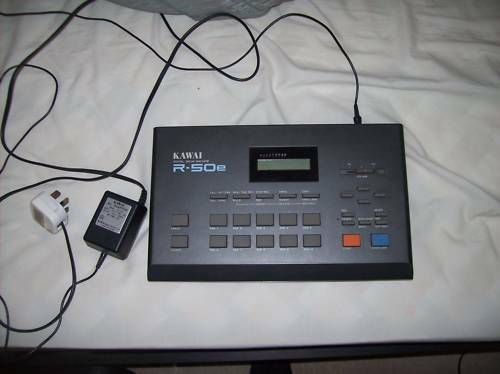 Nice retro digital drum machine in good working order. There is no damage at all but quite a few light scratches and signs of use. BLUE MAN GROUP drum machine Instrument! RARE! ?...for sale! 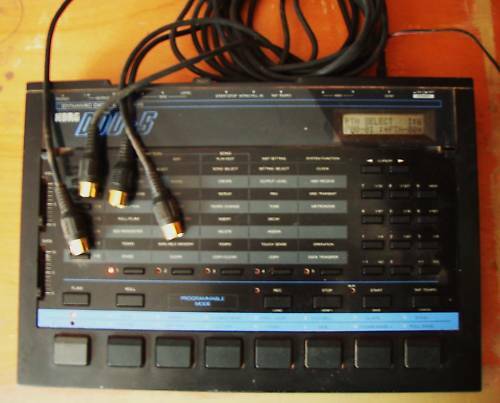 Sellers info: BLUE MAN GROUP DRUM MACHINE INSTRUMENT - RARE ! THIS IS AN AMAZING FIND.. IT PLAYS BLUE MAN GROUP MUSIC OR YOU CAN CONNECT YOUR MP3 PLAYER TO IT. THEN YOU HAVE A WIDE RANGE OF SOUNDS THAT YOU CAN ADD BY HITTING OR HOVERING THE DRUM STICKS OVER THE PIPES ALONG THE BACK. IT LIGHTS UP AND FLASHES, COMES WITH BOTH DRUM STICKS. BATTERIES ARE INCLUDED. VERY GOOD CONDITION, JUST SOME SUNFADING ON THE PIPES. ALL WORKS FINE ! VERY RARE FIND THIS & A GREAT BLUE MAN GROUP MEMORABILIA PIECE !!! 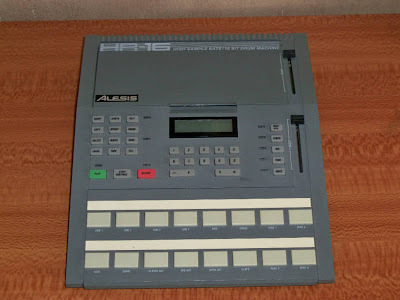 One of Alesis's first drum machines. With 49 sounds including 10 kicks, 7 snares and a complete ethnic set all of which are 16 bit samples.